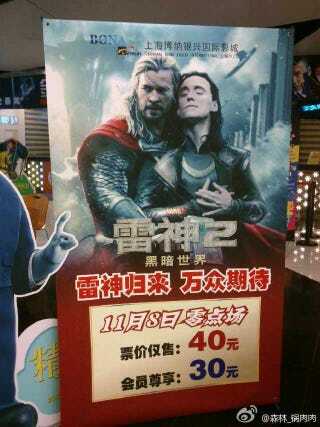 A Chinese movie theater is apparently showing the movie most of the internet wants to see. They used the photo-shopped version of the Thor 2 poster that removes Natalie Portman and showcases the relationship that fan fiction writers want to see. This could be an honest mistake or perhaps the Chinese versions of all the MCU films are a lot different than we all thought. Maybe this explains where Drillpress disappeared to for an entire week.